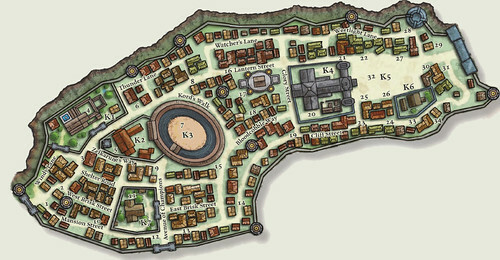 The backdrop in Dungeon #139 introduces the city of Sasserine, an important location in the adventure path. In Eberron, Sasserine is the southernmost island of the Lhazaar Principalities, southwest of the gnome dominated island of Lorghalen; the name is shared by the island and its primary port. The historical Sasserine was a priestess from the Sarlonan nation of Lamecha, and she led her people across the Sea of Rage and the Dragonreach to escape the wars that paved the way for the coming of the Inspired. 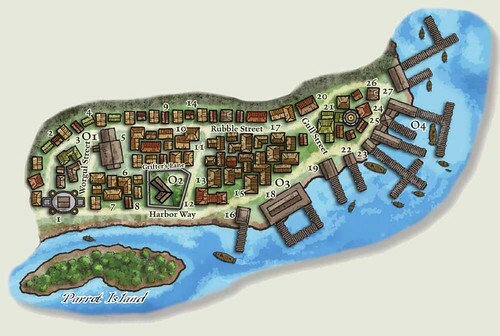 Sasserine is a hard land dominated by jungles and cliffs, and the port city is one of the only safe harbors on the island. In Eberron, human civilization first arose on the continent of Sarlona. Humanity traveled west across the Lhazaar Sea, settling the few islands they found and finally landing on the eastern shore of Khorvaire. These first explorers established the nucleus of what would come to be known as the Lhazaar Principalities. Wave after wave of settlers followed, opportunists and adventurers from across Sarlona. This is reflected in the diversity of culture found across the Lhazaar Principalities; many of the traditions of the Lhazaar city-states can be traced back to the forgotten lands of Sarlona. Not all of the seafarers of Sarlona settled on the coast of Khorvaire. The kingdom of Khunan was one of the mightiest nations of old Sarlona, and the pioneers of Khunan discovered a fertile island in the waters of the Dragonreach. Legends speak of the fabulous wealth these islanders drew from ocean and land. But these legends always come to an abrupt end, hinting at a terrible doom that overcame the people of this so-called Isle of Dread. Now darkness stirs beneath the Dragonreach, reaching out towards Khorvaire. The Savage Tide begins anew! While most maps show Sasserine as part of the Lhazaar Principalities, the nation stands apart from the princes of the north. The Teraknian heirs shunned the pirate lords of the Lhazaar Sea and refused to have any dealings with them. Then came the Last War. As chaos gripped Khorvaire, an alliance of Lhazaar lords—the Sea Princes—seized Sasserine and claimed it as a new principality. Sasserine suffered under their rule for almost a century, until 995 yk, when all of the Sea Princes of Sasserine were killed. No group has taken credit for this act, but many believe it to be the work of the Inspired. Whatever the truth, Sasserine is once again an independent realm, and the Dawn Council must decide what path they will take in the wake of the war. It’s possible to see many traces of old Sarlona in the Lhazaar Principalities, and this is especially true in the case of Sasserine. While Common is the primary language of the land, a significant number of people speak an old dialect of Riedran, sometimes blending the two languages together. The original settlers brought a root crop called sepse from Sarlona, which is a staple of Sasserine cuisine; the island is one of the only places this is found outside of the old Lamechan lowlands. From the style of harpoons used by Sasserine whalers to the design of the ships they sail, there are many small touches that set Sasserine apart from the people of the mainland and the Lhazaars to the north. 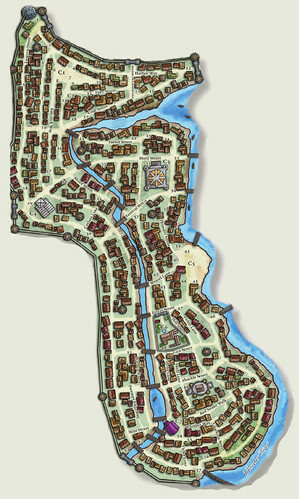 Sasserine is off the beaten track, and the Dragonmarked Houses have little presence in the city. The Sea Princes intentionally isolated this remote port, and as a result there is no airship docking tower in Sasserine, no speaking stone station, and no outpost of House Orien. 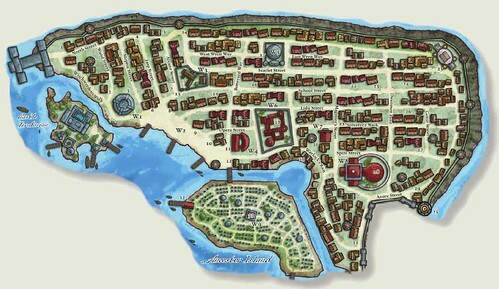 If any of the player characters are dragonmarked heirs, it is possible that they have been dispatched by their houses to evaluate the economic potential of the region; the masters of the local guilds may see such characters as a threat. Anteki could be a telepath, while others described as monks might be lurks or soulknives. However, monastic traditions are also practiced in Riedra, and it’s entirely possible to use the Inspired without involving psionics. Most people think that the Crimson Fleet is led by one of the many Lhazaar pirate lords—that it is the result of a schism within the northern Cloudreavers or the Bloodsails of Farlnen. 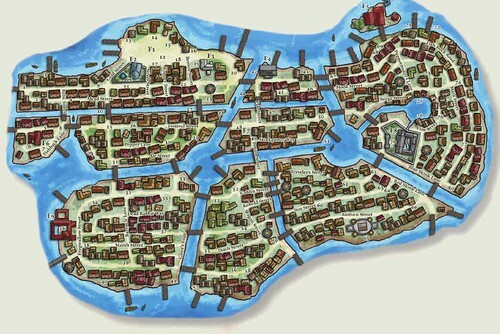 In fact, the fleet is based in Scuttlecove, a city in southern Q’barra, and it is a force with many dark secrets. The Crimson Fleet will be explored in greater detail in the future. As noted in the Age of Worms Adventure Path, the Seeker Lodge could easily be replaced by the Wayfinder Foundation, which is an alliance of adventurers who operate across Khorvaire. Alternately, it could be a new organization aligned with the Aurum or one of Khorvaire’s universities. While Sasserine has thrown off the yoke of the Sea Princes, it still has a few connections with the Principalities. 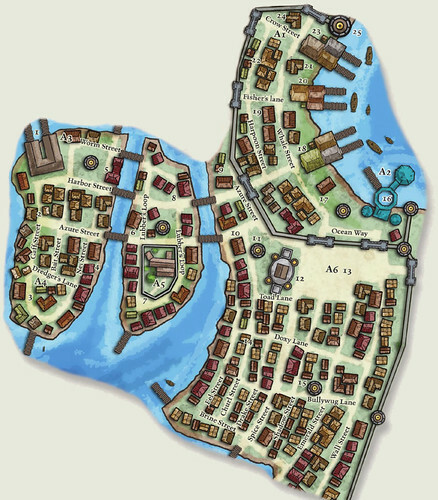 The island is on good terms with the gnomish principality of Lorghalen; many members of the Alchemists’ and Cartographers’ Guilds of Sasserine were born on Lorghalen. There are also a number of changelings from the Gray Tide principality in Sasserine; most of these changelings work as interpreters or entertainers. Some fear that there are far more changelings in the city than meet the eye, but most dismiss this as paranoid delusion. Old Sarlona was home to many religions that are virtually unknown in the present day. The priestess Sasserine brought her Lamechan traditions across the sea, and today her descendants are some of the only people on Eberron who still share her faith. In place of Wee Jas, the people of Sasserine revere the Sovereign of Light and Darkness. The statues of the Sovereign are two-faced; one side shows a man carved from white marble, while the other depicts a woman carved from black marble. The Sovereign is said to be the source of all magic, and privy to all secret knowledge; a typical priest of the Sovereign Host would see the Sovereign of Light and Darkness as being a blending of Aureon and the Shadow. A cleric who wishes to worship the Sovereign of Light and Darkness can choose from the domains and of either deity. While the Sovereign of Light and Darkness is an exotic deity, the people of Sasserine also follow more traditional faiths. Dol Dorn takes the place of Kord. The followers of Olidammara revere the Traveler. Those who worship at the Azure Cathedral seek to placate the Devourer even as they give thanks to Arawai. And the temple of Fharlagnhn becomes a general temple to the Sovereigns, especially Kol Korran, Boldrei, and Olladra. The Dawnhouse is dedicated to Dol Arrah. The Church of the Silver Flame takes the place of St. Cuthbert; it is up to the DM to decide whether Jenya Urikas is present in the setting, or if Father Laro answers to Flamekeep. The Church of the Whirling Fury believes that Dol Arrah and the Fury are one and the same, that the raw passion of the Fury drives her in her battle against evil. The druid Visigash has no connections to the druids of the Eldeen Reaches, but he follows a path similar to that of the Gatekeepers, and could teach the Gatekeeper feats if he adopts a PC druid as his protege. Finally, the cult of Vecna is a branch of the Lords of Dust dedicated to Sul Khatesh, the Keeper of Secrets. The leader of the cult is a rakshasa with four additional sorcerer levels; he uses these powers to inspired fear and awe among his followers. Each of the Seven Districts of Sasserine is represented by an allied church. Traditionally, the seven churches of Sasserine have been on good terms; but unfortunately the last 100 years have placed an undue strain upon them. In particular, the Faithful of Kelemvor and Tempus have suffered. The terrible rift of suspicion and hatred that formed between these churches exists to this day. The remaining four primary religions include Tymora, Lathandar, Shaudakul and Tyr. The final church is in fact comprised of the worship of three sea deties. Numerous smaller shrines can be found in Sasserine, each dedicated to different gods, but these shrines rarely have congregations of more than 50. There are a few evil religions operating in the shodaws of the city- the two most notable are the cult of Shar and a fairly sizable temple of Velsharoon hidden somewhere in the city. In “There Is No Honor,” the player characters are summoned by Lavinia Vanderboren and asked to investigate the mysterious disappearance of her brother. There is little in the adventure that needs to be modified to use it in Eberron, beyond the changes already suggested for Sasserine itself. The Lotus Dragons are one example of the Sarlonan heritage of the region; the name of the guild and the lotus tattoo are both taken from a legendary guild of Lamechan assassins. However, the true Lotus Dragons disbanded over a thousand years ago, and Rowyn has simply lifted the name for her own purposes. The ixitichitl are mysterious creatures, rarely seen by human eyes. As suggested in the adventure, their presence here is foreshadowing of the hand of Demogorgon. Sasserine is located at the westernmost edge of the Black Jungle, nestled in a sheltered harbor. Most travelers come to Sasserine via ship, as overland routes are fraught with peril. From the sea, Sasserine isn't much to look at; two ragged cliffs of stone jut from the coastline, their faces home to seahawks and gulls but little else. Then a vast rent in the cliff slides into view, it summit crowned by the shattered remnants of an immense stone bridge. Sailing between the slowly eroding stone pylons that once supported the bridge above, a visitor passes from open sea into thriving harbor of commerce, whaling and intrigue. Certainly the smell of the city is Breathtaking-a tremendous riot of exotic spices, smoke, humanity, and sewage that assaults the senses. Perfumes and scented candles are popular commodities in Sasserine. 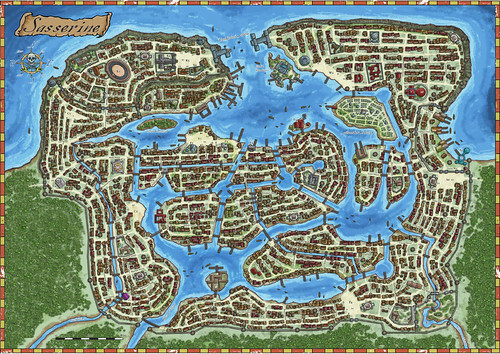 Sasserine is Split into seven distinct districts, each with its own personality. These districts are separated by inner walls, by networks of canals or rivers, or simply by age. Friendly competition between the districts is common, especially during festivals, yet the citizens of Sasserine do not hesitate to come to each other's aid.